Upper Professor is Buried in Snow! Saturday, December 20 was one of those unique ski days. The skiing was fantastic. Last week we ripped up fresh light powder. Saddleback picked up 9"+ mid week and since the mountain was closed last week (they are open 7 days a week now) no one had skied it! This was good and also challenging. Good that we got some fresh stuff to play in and the groomed trials were in mint condition... but challenging in that the snow settled and was a bit 'slabby' where it had not been groomed making a bit difficult to turn. However as the day went on, the snow got chopped up by skiers and then it skied wonderfully. Notably Upper Professor, Jane Craig and Peachy's Peril skied awesome mid-day on. We got into the Wolly Bugger glade for the first time. It always takes a few runs through a glade to get used to it. We had fun exploring all the features and we are looking forward to future runs where we can ski it more aggressively. Safe to say the sawyers of the glade did fine work! Saddleback is working hard to get the upper mountain open. (UPDATE - it will open Monday the 22nd) They were pounding out snow on Tri-Color and Green Weaver. Unfortunately that closed the NW pass and some great terrain on that side of the mountain, but we understand the mountain has to take advantage of the cold temps and get snow on the main trails. Looks like they will have the upper chair open for Christmas which is earlier than usual. Regardless, we had another wonderful mid-December ski experience. But the even more remarkable thing about the day was experiencing nature's beauty. It was a crisp, clear, bluebird day with no wind. There was not a breath of wind anywhere on the mountain. We had vista's like this all day. The Saddleback Canadian Jays were eager for a treat. 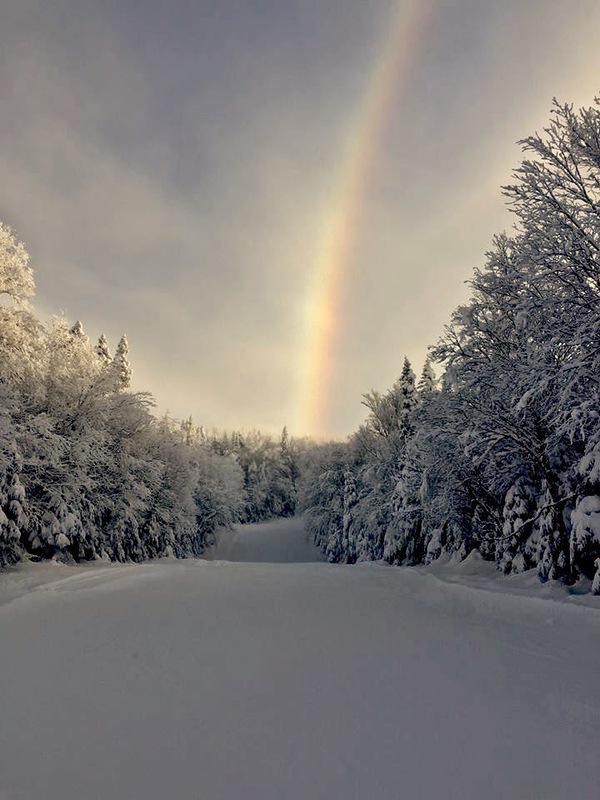 Since the wind was so still, the snow guns filled the air with fine snow crystals... and each chair ride was splashed with "snow rainbows". And a young confused Loon landed on Hudson Highway and scooted down to Red Devil. 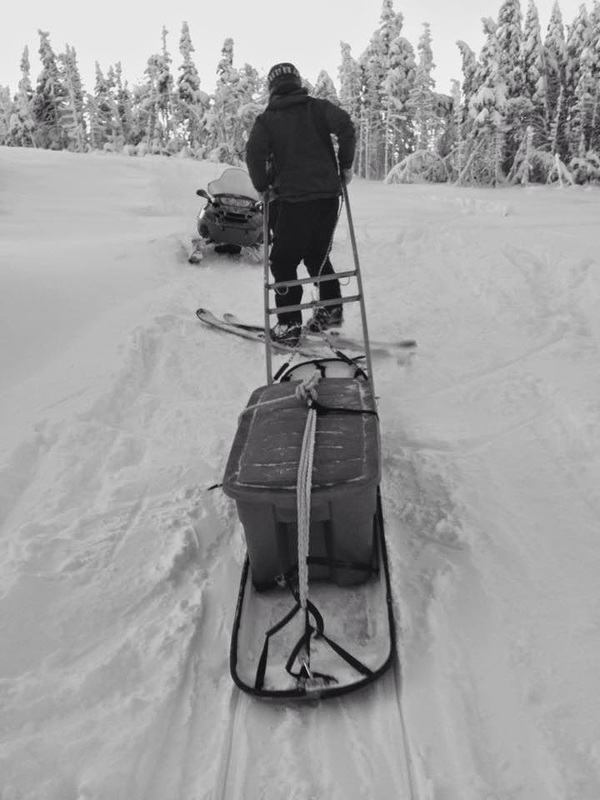 The Saddleback Ski Patrol expertly captured, sledded it off the mountain and released back into the open water of Rangeley Lake. Here is the Portland Press Herald story about the event. You never know what is going to happen at Saddleback but it is a wonderful place to experience nature! Saddleback - December 20th from Alec Salisbury Photo & Video on Vimeo.